TT Electronic Manufacturing Services - TT EMS - Contract Electronic Manufacturers (CEM), manufacture passive components and Hybrid Microcircuits worldwide. electronic manufacturing services, contract electronic manufacturing, quality products, tailor-made service, communications, networking, defence, leisure, consumer RF products, automotive, utilities and industrial electronics, manufacturing and assembly, product test, logistics, quality assurance, printed circuit board assemblies. specialised range of units for the automotive market. Hybrid Microcircuits include thick and thin film styles with a wide range of added components and encapsulation technologies. TT electronics integrated manufacturing services division is a major operating unit of TT electronics plc, with five global manufacturing sites and over 1500 employees around the world. It is the largest UK owned global electronic manufacturing services provider, and provides an access point for facilities in the UK, Malaysia, China and the USA. We have the skills and technologies to produce high-complexity electronic and electromechanical assemblies to the Defence, Aerospace, Industrial, Medical and Telecommunication sectors. 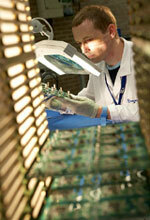 Core capabilities: Design services include PCB layout, DFx, test development. Low, medium and high volume manufacture. 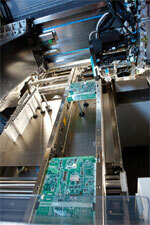 SMT placement including the handling of fine pitch QFPs, µBGA, CSP and 01005 packages. Automated PTH assembly. Aqueous and No-Clean VOC-free processes. System build & high level assembly facility. New Product Introduction (NPI) procedure. Prototyping. Local/global programme management. Supply chain Management, procurement services. Product repair and upgrade facility. Customer specific logistics support. RoHS- compliant and non-RoHS process. Internationally recognised quality standards achieved include BS EN ISO 9001:2002 Quality Systems Management, BS EN ISO 14001 Environmental Management Systems, BSI kite mark - IPC-A-610D (class 3). Our commitment to continuous improvement culture is demonstrated through the achievement of sector-specific accreditations (AS9100, TS16949, and ISO13485) and our commitment to 21st Supply Chain Century programme. (SC21) – signatory since March 2007. Our design and layout facilities enable us to manage your product right from the start. Not only can we make sure that your product is best prepared for manufacture with our Design for Manufacture (DFM) services, but we also offer specialised assistance in PCB layout and electro-mechanical design to take your product from concept right through to final assembly. We provide state-of-the-art electronics manufacturing capability and services on a global scale, delivering complete solutions for the most demanding markets. 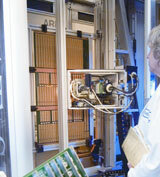 Our latest SMT lines provide greater flexibility for change-over time and off-line set up. They also have greater placement speeds and capability regarding chip and component size, complexity and odd form. We enable our customers to work confidently within a proven outsourcing model to achieve cost and performance excellence in complex electronics systems architecture and operations. We provide innovative hardware, software and manufacturing solutions encompassing functionality, performance, production, aesthetics and ergonomic requirements in the design specification process. Test is an essential stage in the manufacture of your product, and whether you need PCBA or a fully integrated system, we have the necessary test solutions and experience. To ensure reliability and customer confidence in the finished product, TT electronics can assist in developing the right test solution either at the design stage or prior to the manufacturing release. With the increasing use of high pin count BGAs and QFPs, it is essential to identify the product testability as early on in the process and implement the most appropriate solutions. 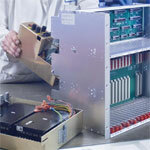 Our electronic test solutions include AOI, X-ray, flying probe, ICT, JTAG and custom functional test platforms. During system integration we offer test solutions for checking large backplanes, during the system build and at the final product configuration. As and when necessary we can support customers with unique software programming, soak testing and ESS testing including EMC testing. We offer a wide range of cable system assemblies from our facility in Suzhou, China where lower cost of production can make overseas sourcing a real cost-saving opportunity. We can offer solutions in: telecommunications, medical, military, power distribution, custom interconnection systems, Special filtered signal cables and RF integrated power and data cables assemblies. Leveraging our experience in design, manufacturing, engineering and supply chain management, we use an established and robust New Product Introduction process each time we launch customers’ products into manufacture. The NPI process is covered by our ISO9001 accreditation; ensuring products are manufactured right first time and crucially shortening the product time to market (TTM). Our approach to quality is data driven enabling timely and efficient reporting to the customer base. It also promotes a culture of continuous improvement and enables achievement of high levels of efficiency. With resident Black Belts and an on-going cross functional Green Belt training programme, we are committed to manufacturing products to the highest possible quality levels within the electronics industry. To complement internationally recognised quality, environmental and worksmanship approvals, we show a pro-active approach to gaining industry-specific accreditations. We offer the benefits of long-term supplier partnerships with supply chain and materials management systems geared to customers' requirements. Supporting our dedicated supply teams at our key manufacturing sites are two International Procurement Offices (IPO) situated in the heartland of component manufacture in China and India. Our IPOs provide access to low cost, quality assured materials, components and services. By working directly with local suppliers in Asia, we're able to remove the risk often associated with off-shore sourcing through local agents.